For years I subscribed to the theory that you simply cannot make brownies from scratch that are as good as those from the box. It's true and I’m absolutely ashamed to admit it. Then, thankfully, one day I woke up. Realizing that everything is better from scratch than from a box (really, who was I kidding? 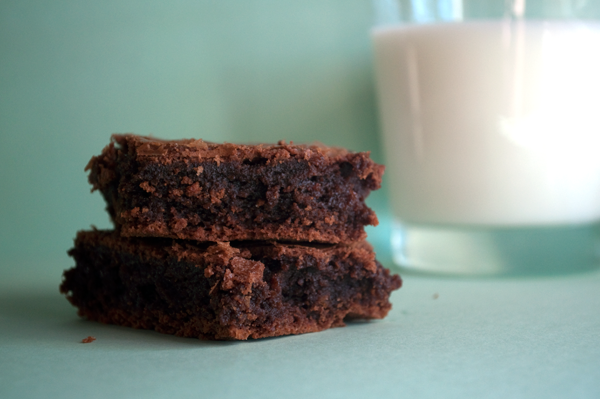 ), I started to search for the perfect brownie recipe, one that would blow that box out of the water. This one has been my go-to for a few years now. It’s rich and decadent with that perfect delicately crisp top layer. I’ve made it both with walnuts and without and it’s divine either way (personally, I like nuts so we add them whenever they’re on hand; the toasted flavor pushes it over the edge into nirvana). Be sure to have cold milk on hand. You’re going to need it. Now those look downright scrumptious! 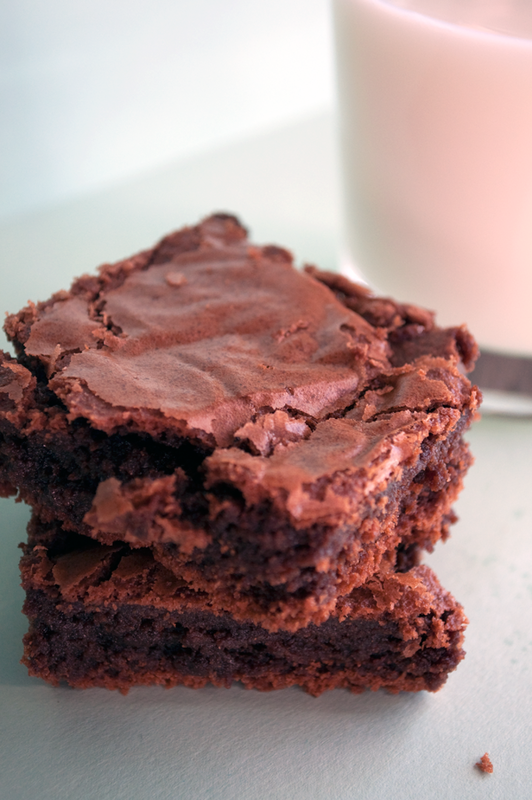 I'm hoping to do some baking this weekend...maybe I'll just have to add brownies to the lineup! oh my! so delish! I'll have to try them! happy friday! they look so moist and yummy! You are killing me. If i had the ingredients i would be making right now instead of writing this...for future ref. Does anyone know what a cup or 2 sticks of butter is in gramms or ounces? I like nuts but somehow, I can never ever have them in my Brownies! These look fudgey & delicious! Thanks, everyone. They are delicious. @ Tracey: 2 sticks of butter is 8 ounces or 227 grams (I think on the grams). Positive on the ounces, though. Hope that helps! Thanks for the recipe! I too have believed for many years that boxed brownies were supreme. I can't wait to try this recipe for my hubby - he can eat an entire pan in minutes! Y-U-M. That recipe looks very similar to my mom's, which I have always thought to be the best (and I'm astounded that people think box brownies are better than scratch)! Maybe my family is weird (okay, we are) but from the time I was a kid, we have always eaten our brownies hot from the oven with butter on them. Everyone has always looked at us like we're nuts, UNTIL THEY TRY IT. Soooo good. Now I have to go make brownies.. those look spectacular! I am huge fan of the Barefoot Contessa Outrageous Brownies recipe. Google it. You won't regret it. They're intensely chocolately and crazy good. So funny, I just made brownies for the first time in a long, long time and made them from a box. I thought it was surprisingly delicious too, so you're not alone! I will have to switch to this recipe though. I love homemade brownies. 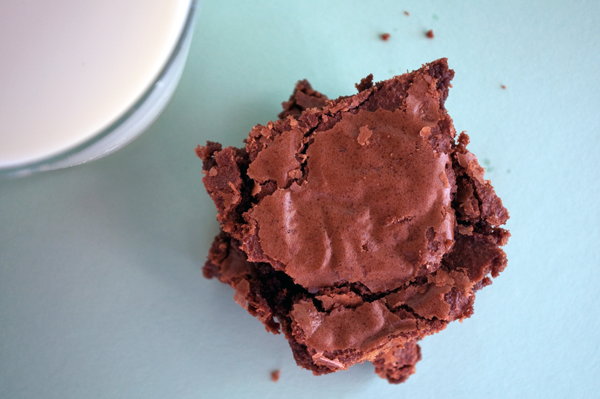 So much better than box-made brownies, and so easy! Such lovely photos too. My favorite brownies are from Moosewood. But so much butter and so many eggs--I have to compromise a little, not that brownies could ever be health food. I think yours are even richer! I think gingerbread from a box is about as good as from scratch. Pie crusts are something I make that people rave about--many are afraid to try and make them, but they are so much better. Yum - those brownies look perfect! I love when they're kind of crispy on top. Oh they look sooooo good! I MUST HAVE ONE NOW! I might have to give them a whirl.